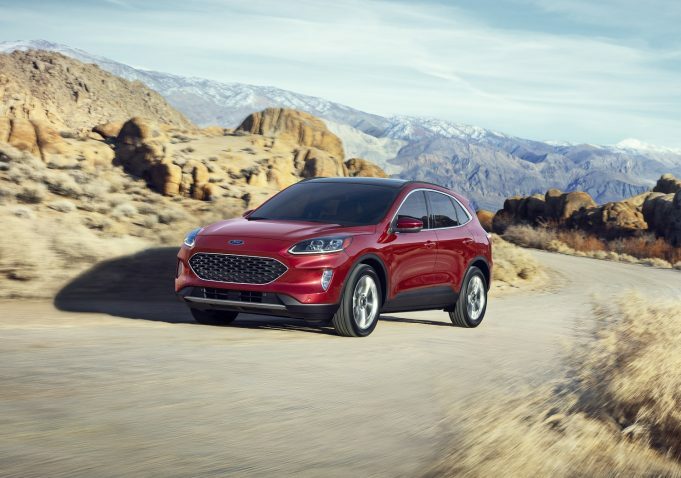 WHEN it hits the market in 2020, the spacious new Ford Escape will not only offer a more aerodynamic design, greater interior space, a stiffer chassis and weigh 90kg less than its predecessor, it will be the blue oval’s first ever electrified SUV in Australia. The plug-in hybrid will offer multiple driving modes to maximise efficiency, with fully-electric mode anticipated to deliver more than 50km smooth, zero tailpipe emissions driving. The power-split architecture combines a 2.5-litre, four-cylinder Atkinson-cycle petrol engine, electric motor and generator, and 14.4kWh lithium-ion battery to produce 165kW. The PHEV battery can be recharged using an integrated charging port. It also features regenerative charging technology that captures kinetic energy normally lost during braking, with the new Escape part of a broader SUV line-up which will include PHEV and optimised EcoBoost power trains. Further specifications and Australian-market details including pricing will be announced closer to the new Ford Escape’s launch in 2020. In other Ford news, the Ranger and Ranger Raptor now comes with autonomous emergency braking with pedestrian detection, across the range. The move follows the addition of other safety features in late 2018. These included lane keep assist, traffic sign recognition and auto high beam. The tech upgrades join an expanded power-train line up which includes an advanced bi-turbo engine with a 10-speed transmission. Other new features included semi-auto active park assist, HID headlights, smart key-less entry, and a tailgate with lift assistance. The Fiat 500 Anniversario looks super cool on the outside, and retro funky on the inside, and is powered by a 51kW 1.2-litre 4-cylinder petrol engine that pushes out 102Nm of torque. WANT a car that sounds good, looks great, and has plenty of go fast, while still remaining under $50,000? For Korean car maker Kia, the desire to further spice up its Optima model range has come in the form of the 2017 Kia Optima GT, which now has a wicked turbo boosted engine.